This page contains descriptions of how to perform various tasks on the CleanEntries website. Just click on one of the items below to get detailed instructions and screenshots. As a coach it is your job to register on the site and add your team to our ever-growing list of teams. As the coach you are allowed to add your team to our database of teams. You do not have to submit a request to add your team and then wait forever to have it added like some other sites. You can do it yourself and have it available immediately. Once you do that then your divers will be able to register for their events using the correct team affiliation. As a coach you can also manage the athletes and other coaches on your team. 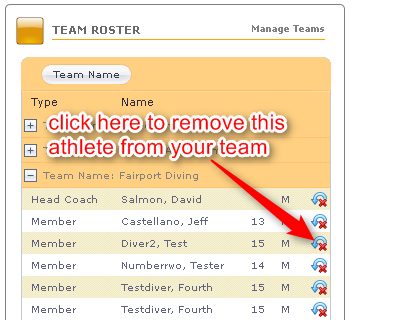 You can register athletes for their events and enter their list of dives. You can also print dive sheets and view at a glance all of your teams upcoming meets on your dashboard. No problem. Just have them log in and click on their Dashboard and then the event they registered for. They can then switch from Unattached to the correct team affiliation from the dropdown list provided. On the divers profile page they can select which teams they belong to. Have the diver log in, click on the Edit Profile link in the upper right corner to view their profile. On that page they can select the team(s) that they belong to. Once they do that they will appear on your coaches dashboard. That's easy. Click on your Dashboard to view your teams and athletes. You will see an icon that looks like a red x with a blue circular arrow next to it. If you click that icon then that diver will be removed from your team. If that diver is registered for any events under your team, then their team affiliation will be changed to Unattached for those events. This is important for the meet host to know who is attending each meet. They may use coaches as judges/officials and seeing who is coming will help them plan ahead. There are also some governing bodies that require coaches to register for meets. That's because neither you or any of the athletes on your team have registered for any meets yet. Once an athlete on your team registers for a meet then they will appear on your dashboard. That is because you do not have permission to edit the athlete registrations for your team. Every team in our database can have one head coach and multiple assistant coaches. The head coach controls which of the assistant coaches have permission to add/remove members from the team and add/edit divers for a meet for that team. Please contact the head coach listed for your team and have them login and change your permissions. As a head coach they can visit their dashboard and with just a click they can give you permission to edit dive sheets, register divers and add/remove divers from your team. If you are the only coach listed for your team (ie. no head coach) then please contact support and we will correct your permissions.